Updated: fixed grammar, added details. T-Mobile USA today announced the pending availability of the Samsung Galaxy Note, which it says will arrive in the coming weeks. 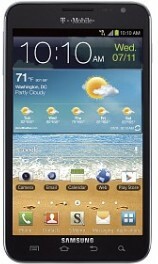 T-Mobile's variant of the Galaxy Note includes the same 5.3-inch display, 8-megapixel camera, and S Pen functionality of the AT&T version, but will ship with Android 4.0 Ice Cream Sandwich, Samsung's Premium Suite S Pen enabled applications, and support for T-Mobile's HSPA+ network at 42Mbps. It also bears the SAFE (Samsung Approved for Enterprise) designation, includes on-device AES256-bit encryption, provides Wi-Fi Calling capabilities, and includes T-Mobile's 4G Pro App Pack (DropBox, LinkedIn, Evernote, and others). T-Mobile said the device will be available at both stores and online, but has not yet provided pricing information. Samsung shoots for the moon with its latest Galaxy phone, the Note for AT&T. This "super phone" offers one of the largest screens on the market, LTE 4G, and a stylus. Might as well wait for the Note II.